with students in her material science class this morning as they test the effects of metallic bonding. 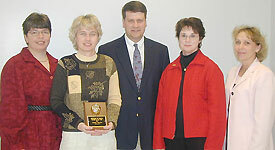 Goodwin was named the 2003 R-2 Teacher of the Year during a ceremony held at the Gary Dickinson Performing Arts Center yesterday. The Chillicothe R-2 School District held the 12th annual Teacher of the Year recognition program yesterday at the Gary Dickinson Performing Arts Center with many of the district's employees receiving years of service awards and Debbie Goodwin receiving the honor of 2003 Teacher of the Year. Goodwin is a science teacher at Chillicothe High School and has been in the educational field for 21 years. "High energy, impeccably prepared, professional and ethical are characteristics that depict Mrs. Goodwin and her approach in the classroom," wrote Bob Levy, CHS principal, of Goodwin serving as the school's representative for the award. "She is known for her high expectations of the students and holds herself accountable for her students' success." Goodwin attended Southwest Missouri State University in Springfield, Mo., completing a Bachelor of Science Degree in Education with a major in biology and a minor in chemistry. She began work on her graduate degree in 2000 and earned her Masters in Education degree from Central Methodist College in Fayette, Mo., in July 2002. 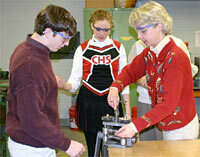 Since 1995, Goodwin has taught science at the Chillicothe High School. She has also taught at Meadville R-IV School and Jarrett Junior High School in Springfield, Mo. Goodwin is a member of the National Science Teachers Association (NSTA), Association for Supervision and Curriculum Development, Missouri State Teachers Association and the Chillicothe Teacher's Association. She has made presentations at NSTA conferences every year since April 2000 and has been accepted to present at the NSTA national conference in Atlanta, Ga., in April 2004. In October, Goodwin was chosen to become a Polymer Ambassador. This is a selected group of approximately 20 teachers from around the national who give presentations and conduct workshops on the local and national level. "I never really considered a career besides teaching," said Goodwin. "I have always had enthusiasm for learning and youth." Goodwin believes that one of her greatest contributions to education in Chillicothe is the establishment of the Materials Science and Technology (MST) class as an elective science course. Chillicothe was the first school in the state of Missouri to make this course a part of its curriculum. Goodwin is active in the community through involvement with the Fellowship of Christian Athletes (FCA). She volunteers her time in student service projects and raising money to send students to summer leadership camps. She is active in the United Methodist Church, serving in the adult bell choir and assisting with the high school youth group. Pictured are this year's nominees for Teacher of the Year. 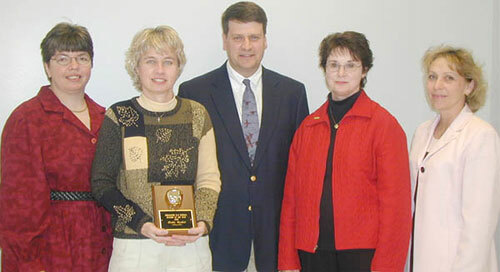 Debbie Goodwin (second from left) was given the honor of winning that title on December 1 at the Teacher of the Year award ceremony. Pictured left to right are: Katherine Gibson, Speech & Language, Dewey Elementary School; Debbie Goodwin, Science, Chillicothe High School; John Debey, Industrial Technology, Chillicothe Middle School; Jonalyn Niberg, Title I for grades 4, 5 & 6, Central School; Dee Alden, third grade, Field Elementary School; not pictured, Sam Smith, Automotive Technology, Grand River Technical School. Other nominees for Teacher of the Year: Katherine Gibson, Speech & Language, Dewey Elementary School; John Debey, Industrial Technology, Chillicothe Middle School; Jonalyn Nyberg, Title I for grades 4, 5, and 6, Central School; Dee Alden, Third Grade, Field Elementary School; and Sam Smith, Automotive Technology, Grand River Technical School. A reception honoring the teachers is Wednesday, January 21, from 5:30-8:00 p.m. at the home of Ed Milbank, Chillicothe, Missouri.